A grateful mindset lets you appreciate the good things that come into your life. Good things, when appreciated, lead to feelings of abundance and contentment. When things are not so good, thankfulness allows you to see bad things for what they are, bad, but also as opportunities to learn. Great lessons are often learned during our most difficult moments. “It is impossible to be both grateful and depressd. Those with a grateful mindset tend to see the message in the mess. When you actively look for reasons to be grateful, you will be amazed at how many you will start to find. It’s the same when you’re looking for anything in life like, for this example, red cars. When you start to actively search for red cars, your increased awareness means you tend to find what you are looking for. Red cars will start to turn up everywhere. Nothing has changed except that your awareness is focused on red cars. Red cars have always been around; you just never paid much attention to them before. Life doesn’t change; your mindset does. With any new mindset, what you think about, how you think about it and how you act can change. Different thoughts and different actions can lead eventually to different outcomes. If you keep up a practice of gratitude it will gain momentum. Comparisons to others, with no gratitude, can often make us feel inadequate, lacking and jealous. With a grateful mindset, comparisons become irrelevant. When we find others in difficult circumstances, we feel empathy, compassion, and generosity. The world needs more of all of these attitudes! When we feel we have enough, it is much easier to share and offer help. With Thanksgiving here, what better time to practice a grateful mindset? 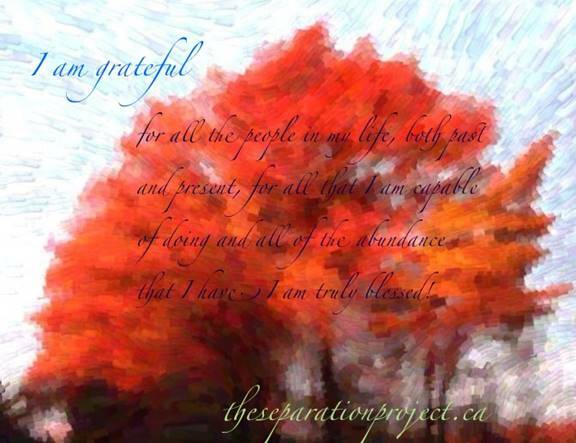 I am grateful for all the people in my life, both past, and present, for all that I am capable of doing and all the abundance that I have. I am truly blessed to be a Canadian, living in Canada, today! I’ve had that “red car” experience so often. And even though I understand why it happens, it still amazes me each time. The red car sitings so beautifully proves your point. What we look for, we find. So if we look for red cars, we see an abundance of them. If we look for things to be grateful for, we notice the big and small things that are visible each day. We choose awareness. I practice daily mindfulness meditation, which is all about focusing on a particular object of attention. It could be the breath, or thoughts, or sensations. While the practice seems simple, my mind will wander off from time to time. That’s normal. But then I bring my focus back to the breath (or whatever I’m focusing on for that particular meditation.) It’s much like the gratitude exercise. Our minds will drift away, but we can choose to bring our attention back to all of the things in life that make us grateful. There’s so much. As you said, we can be grateful for our challenges as they provide excellent learning opportunities. Yes – you find what you are looking for! Thank you for your thoughts, Linda!